Last Friday, hubby brought home 2 Yakult bottles. He said an office mate gave it to him as pasalubong (a homecoming gift) because his family recently had a few days’ vacation in Hong Kong. What I noticed about this Yakult is that it’s taller and wider than the normal Yakult being sold here in the Philippines. This is a 100ml bottle compared to the 80ml Yakult bottles we buy at the grocery stores. It is also low in sugar and high in fiber. I hope we can have this bigger and healthier Yakult here in our country, too. According to yakult.com, “Yakult is a high quality probiotics in the form of a cultured milk drink.” Each Yakult bottle contains 30 billion live Lactobacillus casei Shirota, also called the “Shirota strain.” The Lactobacillus casei Shirota strain increases beneficial bacteria, decreases harmful bacteria and improves the intestinal environment. 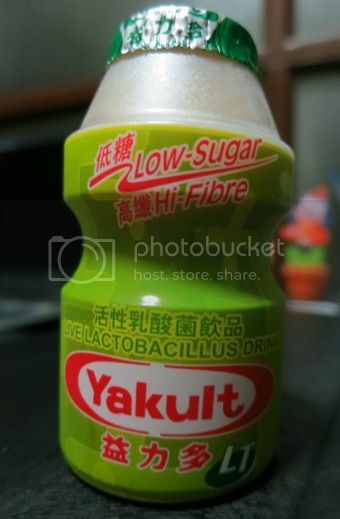 This entry was posted in Healthy Drink, Probiotics, Yakult. Bookmark the permalink. wow!!!! i like that ha!